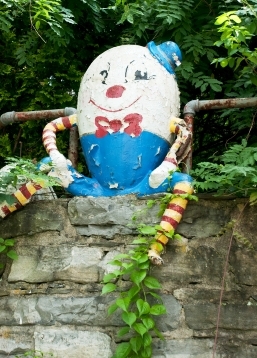 Most recently attributed to Lewis Carrol (Through the Looking Glass), the Humpty Dumpty nursery rhyme actually contains several important insights of value to marketers. Abstraction is a vital tool for marketers… and the absolute best marketers I know are all fans of spreadsheets and segmented response rates. But it’s all too easy to fall in love with abstraction, and in doing so, to lose touch with the market. Of course, the lesson Humpty Dumpty taught us was that to do so is to set oneself up for a BIG fall… to suddenly find yourself overwhelmed by competitors, or with customers leaving you in droves when the market takes a dramatic shift without your awareness. There are some falls from which you can’t recover, no matter how smart you are, no matter who you surround yourself with, and no matter how many resources are at your disposal. One of my first patients was a young, inner city woman with who came to the clinic where I was an intern in order to get help in leaving a life of prostitution. She was depressed and anxious, but genuinely interested in making a change… against the interest of several people in her circles (I leave that part to your imagination). I made a genuine connection with her in the first few sessions. I helped her talk about her plans, got her connected with a social worker, helped her get involved with the relevant community resources, and finally to begin opening up to me about how she got into the life in the first place. And then I broke the egg. And before I went, I reached into my suit jacket (hanging on the chair), and grabbed my wallet to take with me. She blurted out “I ain’t no thief!” (she was right), and wasn’t there when I returned. When I went to talk to my supervisor about the incident, I was SURE he would tell me what to say, and how/when to say it to get her back. I imagined he was experienced enough to know how to solve any situations. A painfull lesson which stayed with me always. I wasn’t in Kansas anymore, and we were playing at the big boy’s table. People’s lives were on the line. Now, the same thing happens to most marketers at some point in their career. For example, I can’t tell you how many times I’ve spoken with people who have a VERY successful product they’ve been selling almost entirely by Joint Venture, and they’re SURE they’ll be able to sell it to a cold audience via PPC. Many have developed years worth of support materials, follow ups, etc., and are sure these will be of great help in porting the success to the paid traffic arena. To no avail though… because that egg’s REALLY hard to unbreak. Or maybe you spent a year building a product in the absence of research and a specific audience to sell it to, and now you’re knocking your head against the wall trying to make progress. I rarely see those projects work. There ARE indeed some eggs which all the king’s horses and all the king’s men can’t put back together again! As a thought experiment, perhaps you can look back on your own marketing projects (or heaven forbid, one you’re working on right now), and ask yourself if you’re trying to unbreak an egg? Much better to know sooner than later. This entry was posted in Inspiration, Leadership, Market Research on April 22, 2011 by quedge9.